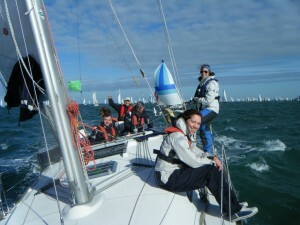 Fancy Joining Round the Island Race? Possibly 2 Spaces – (for the right people) – Wanted for Round the Island 4 Day Training plus Race Weekend. We are always sold out on Round the Island Race. There is always a shortage of boats available and we could easily fill another couple of yachts. It is a great event – and those ‘in the know’ get booked in early. We always do our best to make sure that we have at least 1 (sometimes 2) yachts for individual bookings on ‘Book a Berth’ availability. This year we only have 1 yacht available and it is fully subscribed. However, we do have a regular client (Steve) who has taken one of our Jeanneau 37’s (with spinnaker) for the event on Private Skippered Charter (Buster as Professional Skipper), who could have 2 spaces available for the right people. 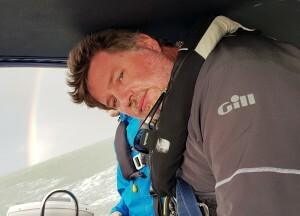 What Steve is trying to achieve is to get 2 more people aboard that would like to do a few days ‘pre-race training’ to learn about spinnakers and how to make the boat go a bit faster and get the guys working as a team – but in a fun, informed and inclusive way. The main aim to have fun aboard but stay pretty local to the South Coast. These 2 people would share the cost of the extra training on an equal share basis. The more mid week days they can do the better… the cost comes down pro-rata. Steve can easily fill the boat for the 3 day event over the race weekend as people will fall over themselves to get aboard just for the weekend – what he is after is for people to come in and share the cost of a few days extra training on the week days prior to the weekend. Those people would take priority and have first dibs at joining for the race (3 day) weekend. If you just wanted to do the 4 days training then I am sure that it would not be a problem. Steve has 2 people (himself and one other) able to commit to Mon- Thur (and more for the Thursday) so another 2 for training would mean a maximum contribution to the charter fee of £425pp for those 4 days (Monday – Thursday) with 4 people aboard. As an example if people could only do Wednesday / Thursday for training the cost would come down to about £275pp for 4 people aboard – but Steve reckons he has another person for Thursday at least so it’d probably be cheaper. These people then would be given first option at joining them for the 3 day RTI event weekend which is equally shared out between 7 at £510pp plus a £50 kitty fee. This is open to adults – couples, individuals, girls or fellas. Drop us a line to info@yachtforce.co.uk and we’ll pass your details onto Steve.